Home InspirationWeddings	What to expect from a Jewish wedding? It is common knowledge that the Jewish Sabbath begins sundown Friday and ends sundown Saturday, therefore do not be surprised if the wedding you are invited to takes place on a Saturday night. Furthermore, according to the Jewish, being married under the stars is symbolic of the blessing given by God to the patriarch Abraham, that his children will be “as the stars of the heavens.” Before the ceremony begins, the Chatan (Hebrew for groom) and the Kallah (Bride) privately sign a Ketubah, or a wedding contract in an enclosed area. In most cases, only parents will be invited to observe the signing. In other cases, the signing of the contract will act as a break in the middle of the ceremony after the groom puts a ring on his bride’s finger. Then comes the fun part: the ceremony! 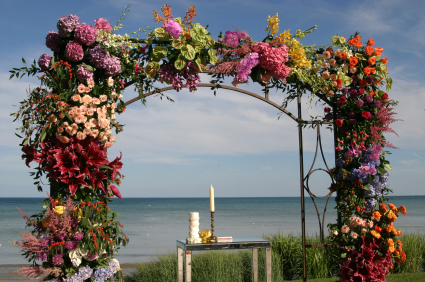 The ceremony takes place under a huppa or a canopy, out in the open air. A huppa is a canopy support by four poles where the bride, groom and rabbi tradtionally stand during the ceremony. The huppa can be greatly decorated with beautiful flowers , string of lights, greenery or garlands, or just left plain. The first part of the ceremony is a celebration of engagement. Historically, the huppa is open on all 4 sides to invite friends and relatives with uncoditional hospitality. The “engagement” process involves the Chatan circling around the Kallah seven times. Then two cups of wine are used in the wedding ceremony. The first cups accompany the Rabbi as he recites the betrothal blessings; afterward both the groom and bride drink from this cup. Then comes the giving of the ring, which should be simple gold with no ornamentation symbolizing that the marriage should be of simple beauty. This is the climactic point of the Jewish ceremony. The Chatan puts the ring on the Kallah’s forefinger of her right hand, recites a brief declaration and voila….according to Jewish ritual this is when the couple is officially married. Interestingly enough, the bride may give her groom a ring, but only after the ceremony. This of course is very traditional, and in a more modern Jewish wedding might very well be modified. According to the Torah and Jewish tradition, the ring the groom gives to his bride represents some sort of investment in his wife to be, as he is supposed to provide her with something valuable to prove that he sees her as worthy. After the ring is put on, either the Ketubah will be signed in front of the guests or the ceremony will continue on to the seven blessings “Sheva Brachot” in Hebrew. These blessings are recited either by the Rabbi, or family members whom the couple wishes to honor. They are recited over the second cup of wine and, at the end of the reciting, the couple drinks some of the wine. Now comes the infamous part of any Jewish wedding, the breaking of glass. A glass, typically a wine glass, is placed on the floor in front of the Chatan. Some say that this is the last time the groom will get to “put his foot down.” The breaking of the glass marks the end of the ceremony, and this is when you can shout “Mazel Tov”, or congrats, along with all the other guests. Then the chatan and kallah are treated to a reception with the guests; however do not be surprised if they disappear for a few minutes before the reception. Traditionally the bride and groom have a few minutes of privacy in a “yichud room,” these brief moments symbolize their soon to be status of living together as husband and wife. At this point they will be very hungry due to fasting since the morning and will have something to eat. Then the reception will take place and the bride and groom will mingle with guests during an all night celebration with food, beverage and entertainment for all to enjoy! Mazel Tov! What to Expect from an Indian wedding?